Beautifully handcrafted British made gifts under £30. Not every gift has to cost a fortune. A little something special that has been thought through is just as appreciated. You can lavish them with thought, not money. 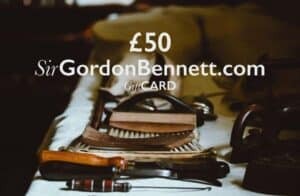 Here at SirGordonBennett.com we purvey specially curated products that people will not only want, but love. From brands that care deeply about the products the make. That look beautiful, are made better, work as they should and are made right here in Great Britain. If you are looking for something especially for the Lady in your life? Click to see Sir Gordon's ideas for her. Or if you are looking for a certain Sir? Click here. The ideal gift for a writer, whether they are a blogger, diarist or doodler. This classic collection is just right on the money when it comes to a small gift to show your appreciation. Handbound in Yorkshire.